If you've ever wondered how I find all of these wonderful tattooed poets, I must give credit to all the awesome un-inked wordsmiths who send contributors my way. 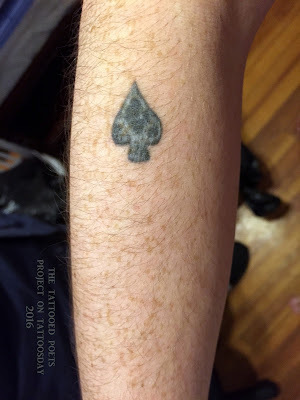 Case in point, at last fall's launch reading of The Best American Poetry 2015, I was speaking to several poets after the event, and Terrence Winch, one of the contributors, told me I should talk to Michael Lally, who had a tattoo dating back to the 1960's. symbolizing my rejection of the white world. so tough to me. He stopped and turned to me. you got balls, don’t give me any trouble. I didn’t. Michael said he got this spade "in a tattoo parlor in Rantoul, Illinois" when he was 18. Michael told me, "my youngest son talked me into letting him get the same tattoo when he was 15, saying I’m old (70 at the time) and have had some health scares so he wanted me to be there when he got it to see that he was permanently marking himself with a look-a-like tattoo as a tribute to his father." 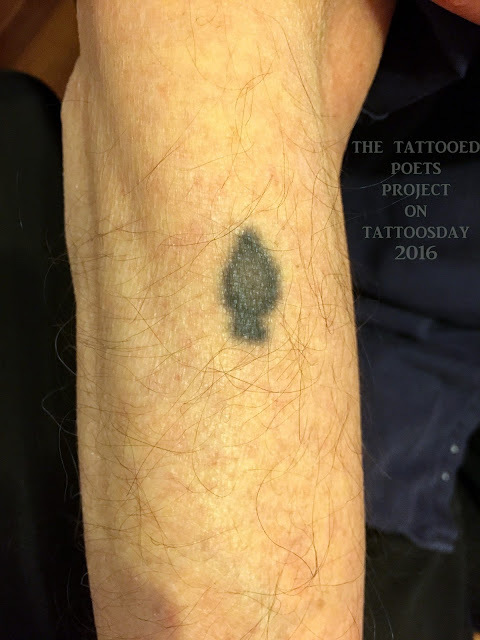 It's an honor to have Michael Lally among the ranks of Tattoosday's Tattooed Poets Project and I thank him for sharing his tattoo and poems with us here. Excellent---great to see these poems (and the tattoos).